CMSS Syndicates sire Lady Grove Conrad gets his first official LPI this round, and he debuts at #3 LPI at +1897. His EBVs are +293M +34F +0.34% +12P +0.10% +7 Conf 2.85 SCS. From seeing daughters and getting feedback from producers, these numbers align reasonably well with what I’ve been hearing. When making matings, Conrad should perhaps be protected for feet and legs as well as stature. However, udder scores are generally an improvement on dam and his milk production and conformation are an improvement on his sire, Jurist Ace. Conrad is available from Semex. Making a big move up the list this round is Ecuafarm Kaiser Royalty, rising to #8 LPI at +1385. Royalty’s production proof is only at 51% reliability yet, and his type proof is only at 44% reliability, so expect these numbers to change. That being said, his Canadian proof is starting to more closely resemble his US proof on the production side (+140M), while his type proof (at +3) is still be weighed down a bit by a parent average based on no Canadian data. I would expect this conformation proof to improve as more daughters are classified, based on feedback from breeders. Please note that these MACE evaluations do not include type information at this point. There isn’t much change at the top of the LPI Cow rankings this round, with the Chardonnay family continuing to dominate the top of the list. 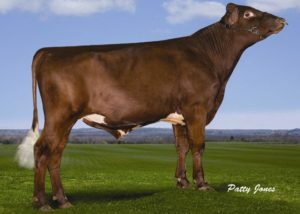 Lady Grove BJ Cherry gains 140 points this round to jump to #4 LPI, just behind her dam. Full listings are available online at https://www.cdn.ca/files_ge_articles.php.